With emerging technologies, such as social collaboration, mobility, and other advanced solutions, “slow and steady” is getting left behind. 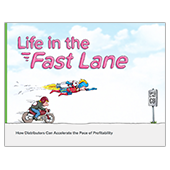 This eBook explains the advantages of joining forward-thinking distributors in the fast lane. Please fill out the form below to view the full Whitepaper "Life in the Fast Lane: How Distributors Can Accelerate the Pace of Profitability".